Upon finding a rust spot on your vehicle, your first concern may be the impact on its exterior. The presence of rust on the surface, however, indicates a larger issue within the interior of the car — a structural weakening of the car’s metal frame and components — which translates into a potential concern for safety. Addressing the rusting of cars requires an understanding of the electrochemical process behind this effect, a phenomenon known as corrosion. In corrosion, metals react by oxidation, or the loss of electrons. The oxidized metal ions typically form salts of the original metal that lack the good structural properties of the metal itself. 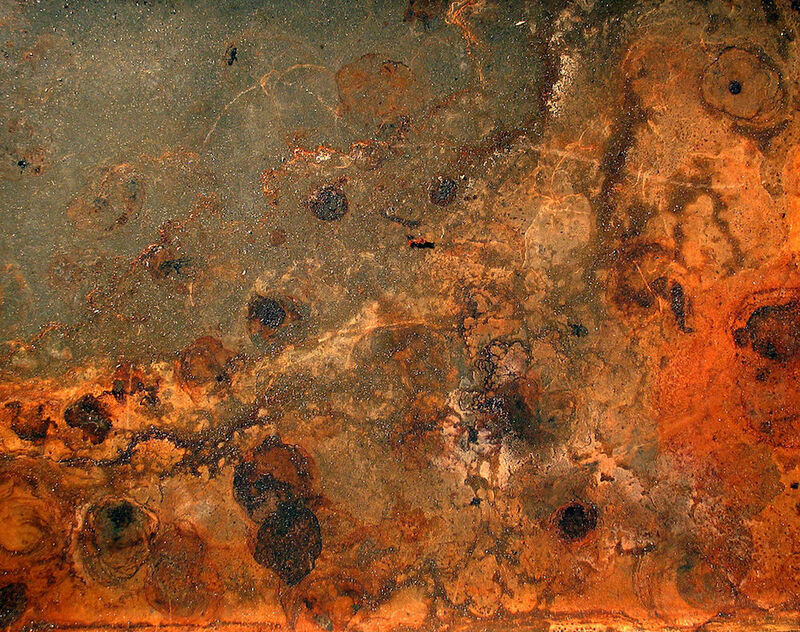 The oxidation of iron in steel in the presence of water generates hydrated iron oxides — the familiar orangish color of rust. Such an effect is common in the engines of cars as well as their frames and exhaust systems. 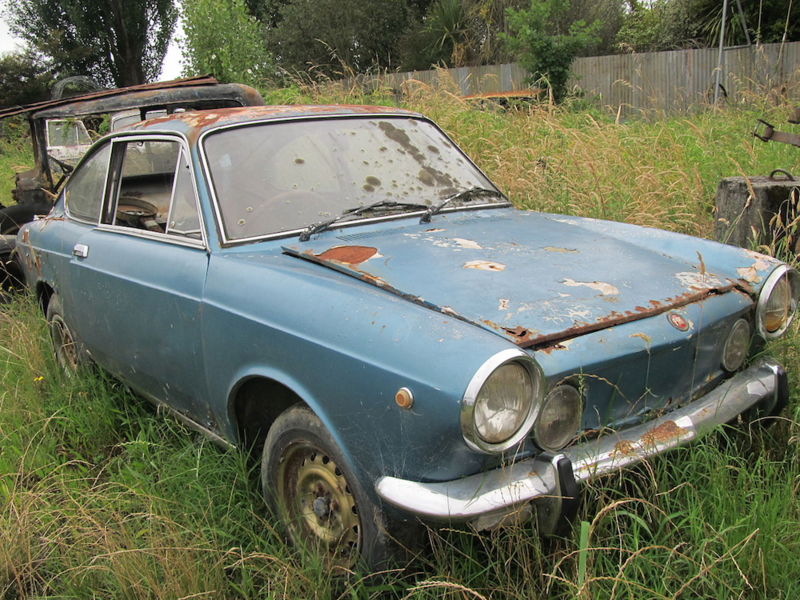 Rust is the most common product of corrosion. Image by Roger McLassus, via Wikimedia Commons. Let’s begin by taking a look at a few of the most common types of corrosion that can occur in automobiles. When any metal surface of an automobile comes into contact with air containing some moisture, atmospheric corrosion can occur. A thin (micron-scale) film of moisture deposited under nonzero humidity conditions is sufficient to cause the gradual decay of iron and steel surfaces, producing iron oxide, or rust. This in turn impairs the mechanical integrity and reduces the lifespan of the metal. The thickness of the film depends on factors such as ambient temperature and pressure, relative humidity, and the presence of salts. Atmospheric corrosion of a nail. Image by Thomas.maeder — Own work, via Wikimedia Commons. Crevice corrosion refers to electrochemical processes that occur in confined spaces such as gaskets, seals, flanges, and spaces filled with deposits. This type of corrosion is a localized form of attack due to the presence of a stagnant solution or an electrolyte. It is difficult to detect and can lead to sudden failure through a phenomenon known as stress corrosion cracking. Crevice corrosion of steel around the outside of a tube. Image by Webcorr — Own work, via Wikimedia Commons. In cases where two different metals are placed in electrical contact, one metal can corrode preferentially with respect to the other metal. This process is referred to as galvanic corrosion. The presence of rust on nuts and bolts that join together automotive components is one example. Such deterioration results from the fact that different metals have different corrosion potentials, meaning that they have a different propensity to lose or gain electrons. Galvanic corrosion between bolts and a plate made from different metals or alloys. Image by D3j4vu, via Wikimedia Commons. Pitting is similar to crevice corrosion in the sense that they are both localized forms of corrosion. Pitting typically occurs in otherwise passive materials when the passive oxide film that normally protects the metal is broken down as a result of a chemical or mechanical attack. The chlorine in salt water is good at breaking down such passive oxide films, and is why cars that frequent coastal places are more likely to be subject to this type of corrosion. 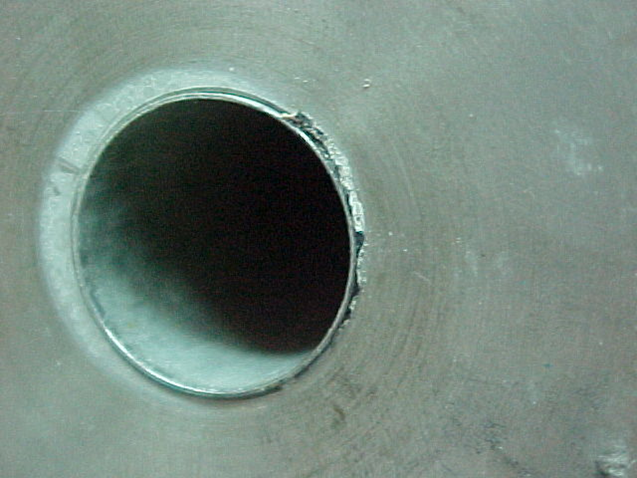 The resulting pits can grow deep within the metal undetected and ultimately lead to catastrophic failure. A corrosion pit prior to and after blasting. Image by Cafe Nervosa — Own work, via Wikimedia Commons. The causes of corrosion in vehicles can be traced back to the manufacturing stage as well as to environmental conditions on the road. Galvanic corrosion, for instance, can result from the use of different metals for various automotive parts. The inherent microstructure of the metal also plays a decisive role. Due to the recent trend of lightweighting, the use of magnesium (Mg) in automobiles has increased significantly. Mg is a favorable engineering material in terms of its high strength-to-weight ratio and its good castability; it does, however, display poor corrosion characteristics. For example, it has been reported that the α-phase of Mg is more prone to corrosion than the β-phase and can lead to galvanic corrosion between the phases. Grain boundaries within a metal can generate forces behind deterioration as well. When on the road, vehicles are subjected to a wide range of environments including extremely hot and cold temperatures, in addition to operating within coastal areas and near chemical factories. All of these conditions can result in atmospheric corrosion. Even a small scratch during operation can lead to a corrosion cell arising in the surface moisture film, with the use of de-icing salts in cold environments further accelerating this process. Crevice corrosion, meanwhile, results from the accumulation of dirt and debris in confined spaces such as door flanges and wheel wells. Due to the presence of wet condensates and appreciable concentrations of chloride ions, automotive exhaust systems are highly susceptible to pitting. Visible effects of corrosion on a car. Image by Riley from Christchurch, New Zealand, via Wikimedia Commons. When it comes to testing corrosion in vehicles, outdoor testing is often used, where a vehicle is left out in the open for a certain period of time. Salt spray tests and cyclic loading are also common experimental techniques. The salt spray test is carried out in a closed chamber where the corrosion resistance of a coating is measured by exposing it to an acidic environment, via a salt solution or an acetic acid. Cyclic loading refers to subjecting the test specimen to alternating wet and dry cycles. This is an accelerated form of testing that can provide a reasonable estimate for preventive measures against corrosion. As you can imagine, these experimental routes require a significant amount of time, labor, and costs. Additionally, ensuring the reliability of the tests’ results often means that they must be run several times, further adding to this effect. The Corrosion Module in COMSOL Multiphysics features built-in interfaces, features, and examples for modeling these different types of corrosion. The output of such an analysis is the localized current density, which is used to calculate the average corrosion rate of any component over a given period of time. It is also possible to observe the impact of environmental variables like relative humidity and salt load density. These simulation results can be compared against salt spray experiments to obtain an estimate for the corrosion resistance of a coating. 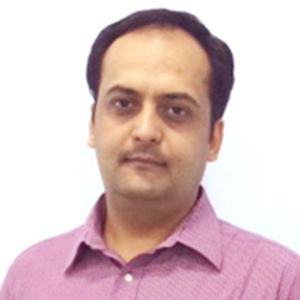 In one example, researchers at ArcelorMittal were not only able to identify the underlying causes of corrosion, but they were also able to predict the optimum thickness of the coating to protect the substrate. Their results showed good agreement with the available experimental data. With the Application Builder in COMSOL Multiphysics, you can now build easy-to-use apps that enhance the efficiency of your corrosion modeling. Apps enable corrosion engineers with varying levels of simulation expertise to define any set of input parameters and quickly simulate important characteristics like the average corrosion rate. These capabilities can be combined with structural analyses, for example, to investigate the structural integrity of any component. 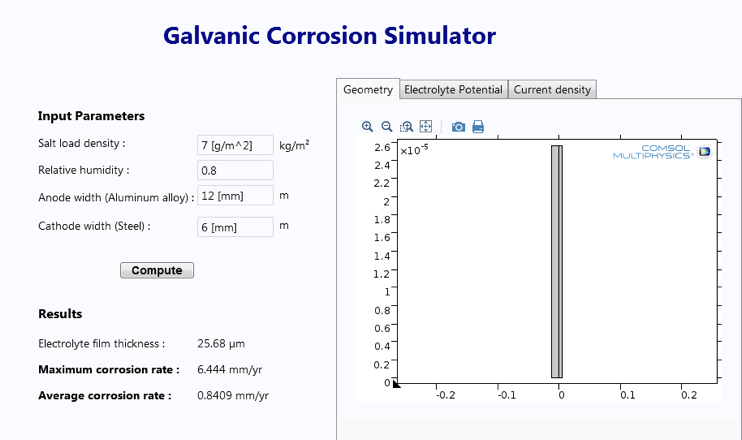 Screenshot of a simulation app designed to study galvanic corrosion. Here, we have highlighted the use of simulation to better understand the fundamental mechanisms behind corrosion at the microscale. Simulation analysis can assist in the identification of corrosion-related problems within the automobile design process. Many automotive companies augment their analysis with simulation methods such as those found in the Corrosion Module, reducing associated costs and expediting the time to market. Please visit: https://www.comsol.co.in/corrosion-module for more information on the Corrosion modelling capabilities of COMSOL.